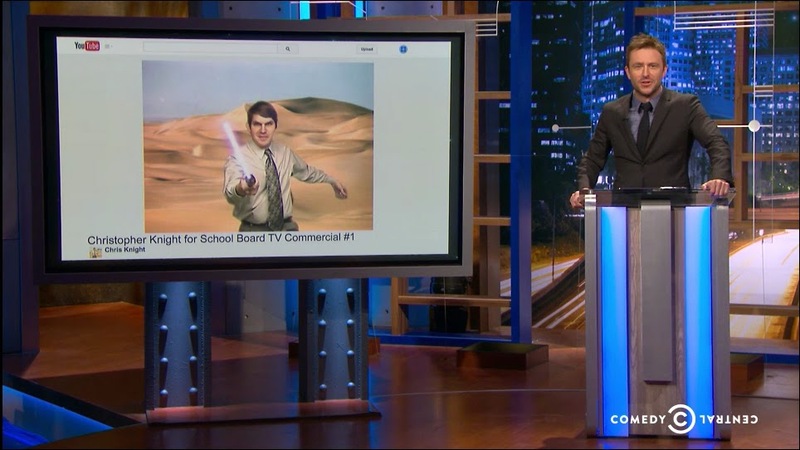 Yes, it's true: Chris Hardwick used my school board commercial - the one with the Star Wars theme - on his Comedy Central show @Midnight late last night/the wee hours of this morning. The clip came during a segment called "Smeared Campaigns" and was one of three political ads taken from YouTube. I would have missed it had good friend Aaron not spotted it. I was hopped-up on Dr. Pepper and Swiss cheese, wrestling between sleep and stuff about my book, when I happened to get on Facebook and Aaron was blasting my timeline with the news. Needless to say, I had to check it out. And you can too: here's the link that takes you straight to the episode's stream on the Comedy Central site. It comes on shortly after the first commercial break. And it's pretty hilarious! But I'm still shaking my head in disbelief that more than eight and a half years later, this commercial is still getting all that attention. Congratulations =) Your commercial is one of the greatest ever!